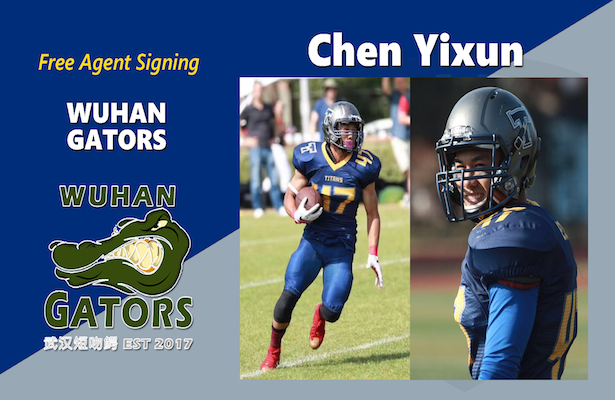 The Wuhan Gators became the first China Arena Football League team to sign free agents as they added slot receiver Chen Yixun from Guangzhou and Xiao Canyang of Qingyuan City who is projected to play linebacker when the league returns to action next spring. Wuhan head coach J.W. Kenton saw Chen at the 2016 Shanghai combine but said the receiver known as “Eason” to scouts in the United States, was a victim of the elements. “The weather conditions that day were horrible,” Kenton said. “He signed up as a running back and as a result he slipped through the cracks. Later I saw him playing running back for the Shanghai Titans in the American Football League of China and new knew we had to have him,” the coach added. Chen, who has the distinction of being the CAFL’s first ever free agent signee, is a training partner of Xinhe Xu who was the tenth leading receiver in the CAFL last season for Shenzhen with 21 receptions for 301 yards and seven touchdowns. Chen, who is listed as 5’7”, 165, began playing football in Guangzhou in 2015 when his friends encouraged him to play for the Guangzhou Tigers. Adding Chen is a plus for Wuhan as they like to employ an offensive set using three Chinese receivers and his signing will add depth. According to Kenton, “Eason is faster than Xinhe. He may be our fastest Chinese player. He has decent hands, now we just need time to coach him up on his route running and playing indoors. 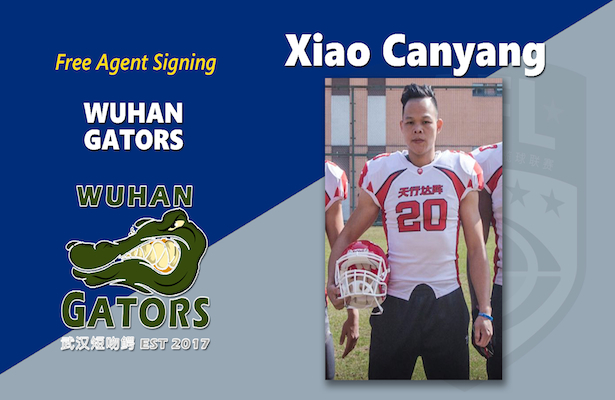 He will be a great addition to our receiving corp.
Also coming to terms with the Gators was Xiao who studied at the University of Traditional Chinese Medicine. His path to the CAFL started in 2012. Also known as “Michael” at 5’10”, 189, Kenton likes Xiao’s speed and strength. “Michael attended the combine in Shanghai this past May. He was a big score for us. He has good speed, 4.6 (in the 40 yard dash) but more important is that he is very aggressive. He attacks the football and we expect him to make our defense much faster and secure with his ability to tackle,” Kenton said.